"A very quick, easy Italian-inspired pork chop. Great if you're just looking for something a little different. This is just a little something that I threw together and it turned out fantastic! Now it is one of my husband's favorites! Eat and enjoy!" 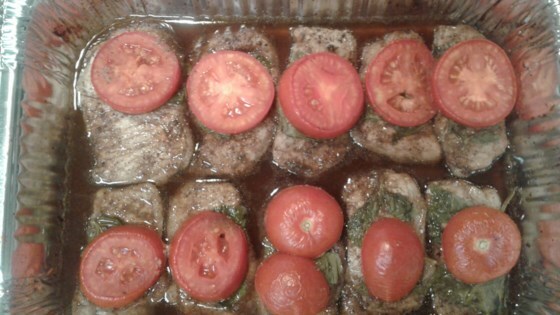 Arrange pork chops in a baking dish. Whisk basil, onion powder, and seasoned salt together in a bowl. Drizzle half of the balsamic vinegar over pork chops and spread to evenly coat; top with half of the basil mixture. Flip pork chops and coat with remaining balsamic vinegar and basil mixture. Place 1 tomato slice on top of each pork chop and let stand for 10 minutes. Bake in the preheated oven until pork chops are cooked through, 35 to 40 minutes. An instant-read thermometer inserted into the center should read at least 145 degrees F (63 degrees C). Remove baking dish from oven and allow pork chops to sit in the dish for 10 minutes. So easy and soooo good!!! I substituted organic basil and oregano instead of the dried bottled seasoning. This was so tasty! My kids loved it too... I just cooked one with no tomato for the child who doesn't like tomatoes. Very easy to make. Definitely will be making this again! I prepared half the recipe for just the two of us. It was easy, but I've tasted many pork chop recipes I liked better. I probably won't be making the recipe again. These pork chops were easy and delicious. My husband raved about them. I used small steaks with the recipe too and they were just as good.